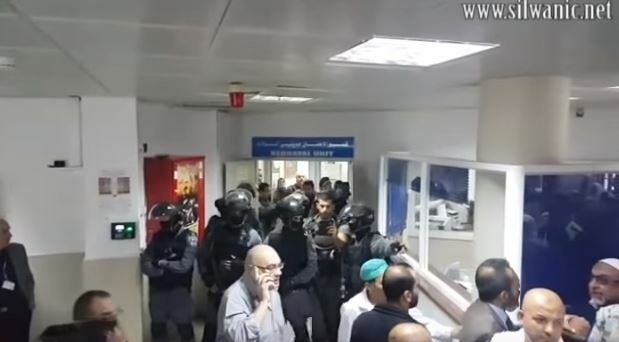 The administration of the Al-Makassed Islamic Charitable Society Hospital in Jerusalem has reported that the hospital has been a frequent target of Israeli military invasions and attacks, and that the soldiers are also trying to access patients’ records. Latest invasion was carried out Wednesday. Head of the hospital, Dr. Rafiq al-Husseini, said the employees and physicians have been repeatedly ordered to hand patients’ records to the army, including admissions and reasons for hospitalization, but they refused despite pressures and threats, and insisted on respecting the patients’ privacy. On Wednesday, dozens of soldiers surrounded the hospital and invaded it, for the second consecutive day, and attempted to access medical files, especially the file of a Jerusalem child who was recently admitted, and was released later, before the soldiers kidnapped him. He added that the hospital is a charitable society, and frequently provides medical services to patients, and wounded Palestinians, without even opening new records for one-time visits. Al-Husseini said neither the doctors, nor the administration, will ever violate the patients’ privacy, and will never provide Israel or any authority any information. Dr. al-Husseini also stated that the hospital believes the military invasions will continue, especially since they were never able to find records, or documents, in addition to the frequent threats, and attempts to intimidate the staff, including physicians and nurses. He added that the soldiers also took the names and phone number of several employees, especially those who work in Emergency and Urgent Care Units, in order to summon them for interrogation. Dr. al-Husseini stated that the Wednesday invasion targeted the administration building and the maternity ward, leading to arguments with the medical teams, the patients and their families who protested this outrageous violation. The doctor also called on the international community to intervene, and provide the urgently needed protection to the Palestinian people, especially the patients.